Skoda Citigo Performance, Engine, Ride, Handling | What Car? The choice of engines is a simple one. There are only two, badged 60 and 75 respectively, and both are 1.0-litre petrols, so you just need to decide if you want 59bhp or 74bhp. The lower-powered version is up to the job if you mostly drive in built-up areas and is our favoured engine because of the value for money it offers. It's not quick, but accelerates smoothly and easily keeps keeps up with urban traffic. However, if you regularly venture onto motorways and A-roads, it's worth considering the 74bhp engine. Being only available in the pricier SE L trim makes it rather more expensive, but it provides noticeably stronger acceleration. That said, the more powerful engine does have to be worked hard to deliver the extra thrust. You can choose an automatic (ASG) gearbox with both engines, but it's best avoided. Gear changes are decidedly sluggish, so you tend to lurch forward and backwards in your seat like a nodding dog whenever you accelerate. It’s particularly frustrating if you’re trying to manoeuvre on a hill as it doesn't have a creep function like a regular automatic. For such a small car, the Citigo does a remarkable job of smoothing out all manner of lumps and bumps in the road. The ride is supple over speed bumps at low speeds, and broken surfaces and potholes are dealt with effectively. Things even remain comfortable at higher speeds on A-roads and motorways, where the Citigo feels exceptionally composed for such a small car. We’d avoid the sports suspension, though. It's optional on most versions and standard on the range-topping Monte Carlo and doesn’t make the ride uncomfortably firm, but you do feel bumps rather more as they pass beneath the car. We would also recommend sticking to 15in wheels, as potholes and sharp bumps are more noticeable when 16in wheels are fitted. 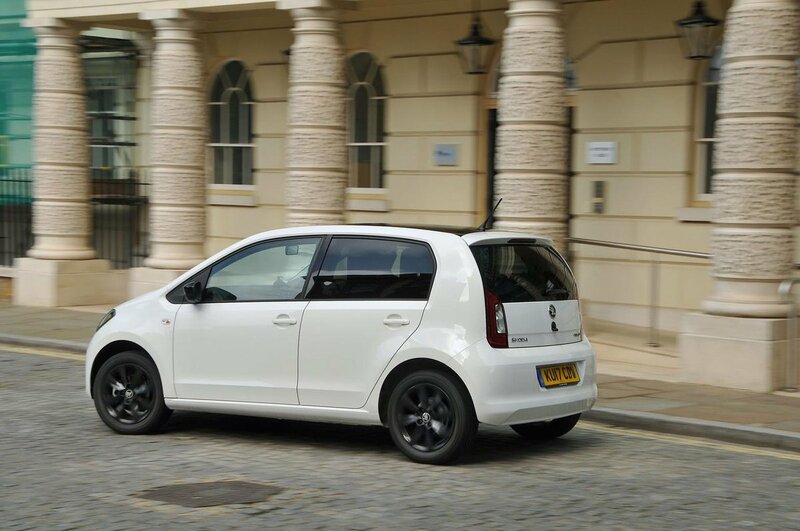 The Citigo – along with its Seat Mii and Volkswagen Up sister cars – is the best-handling city car on the market. In fact, many £20,000 hatchbacks could learn a thing or two from the Citigo. Its steering is precise with a well judged weight to it, and its suspension does a good job of preventing the car from swaying about too much through bends. There’s also a decent amount of grip and, unlike many competitors, the Citigo isn’t tossed around too much by crosswinds on the motorway. Just as crucially, it is effortless to drive around town and easy to slot into tight parking spaces. City cars aren't renowned for their peaceful cruising manners, but the Citigo is one of the quietest. True, its three-cylinder petrol engine sounds a bit coarse when you push it hard to get to motorway speeds, but it's nothing that will really get on your wick. You don't feel much vibration through the pedals or steering wheel, either. A bit of road noise creeps into the interior at higher speeds – a Hyundai i10 is better in this respect – but the Citigo’s five-speed manual gearbox is light and precise, with plenty of feel in the clutch and brake pedals, so it's easy to drive smoothly at all speeds. The ASG automatic gearbox isn’t quite as impressive, lurching between gears and getting confused if you come on and off the accelerator quickly.